Furthermore, Copperloy designs their forklift ramps to be defended against the wear and tear caused by usual loading dock procedures. Copperloy ramps have unbeatable lifespans. They provide products with some of the highest strength and stability in the industry. Copperloy yard ramps also include many features that set them apart from competing products. 8-Foot Level Off: A major feature of Copperloy ramps, the level-off provides smoother access for forklifts onto platforms, trucks, and loading docks. Hydraulic Pump: The hydraulic hand pump is cleverly placed on the outside of the ramp for more convenient access. Compared to other industry products, this single-acting hand pump is much simpler to operate. Its location protects it from the usual dirt and damage a loading dock can cause. This saves immense amounts of time on maintenance. 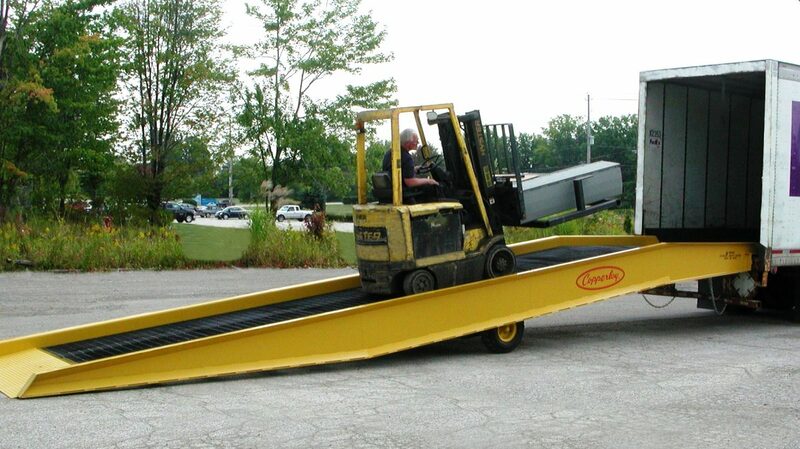 Low End-Plate and Safety Curb: Other ramps can make access for forklifts a stressful task. Copperloy ramps, however, have a low end-play that is shorter than a forklift’s wheelbase. The forklift can easily access the grating on Copperloy ramps while having the back wheels safely on the ground. There is also a seven-inch safety curb that prevents runoff. Copperloy ramps make the loading process much smoother for forklifts. Solid/Pneumatic Tires: Air-filled tires requires a substantial amount of time for refilling and maintenance. Therefore, Copperloy designs their ramps with solid tires that come with well-lubricated bearings. They do not need constant maintenance and inspection, providing convenience and reliability. This is only a small collection of the myriad of advantages Copperloy forklift ramps can provide. Loading dock operations in needs of major improvements to safety and efficiency should consider Copperloy ramps.